The airport may be practically in another time zone, but the trek into Melbourne is emphatically worth the effort; particularly when you have such an exhaustive guide to what to do and where to do it, courtesy of Sean Baxter. This is definitely not your average 48 Hours list. It has been compiled from every long-winded text message sent to friends, and friends of friends. It has been transcribed from the countless napkins and receipt rolls offered over the multitudes of bars by their over-zealous barkeeps. It has been collated from a menagerie of business cards and food menus tipped out of wallets and handbags after many, many fabulous nights out. It is detailed, yet still manages to miss a good deal of life-long friends, fabulous watering holes and exquisite eateries. For this, I humbly apologise. 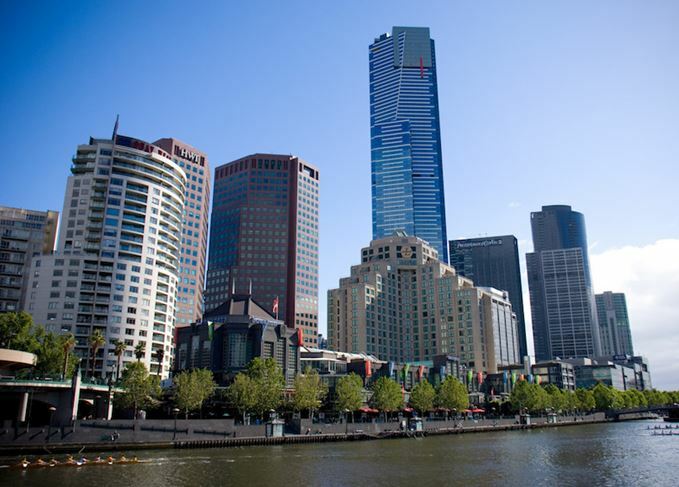 Arriving in Melbourne in the morning, you’ll have a chance to take in a few interesting sights in the minimum 30-minute drive from the airport to the city. Seriously: 30 minutes. You almost need another small aircraft to drop you closer to town, and it’s no accident that Melbourne’s main street was named after Robert Burke, one of Australia’s most famous explorers. You’ll need a small team of camels and a vast quantity of water just to get close. Take the Sky Bus – it will be a far more relaxing ride than forking out a fortune in a cab fare. If you arrive in the morning, drop your bags and head to Cumulus Inc. This is a Melbourne institution and has easily one of the best breakfasts in the centre of town. The full English is spectacular, with blood sausage on toast and luscious farmhouse slab bacon. Eat up: you have big day ahead of you. The MCG is only a short walk if you want to check out the National Sports Museum or do a tour of the ground if there isn’t a game on. In summer it’s home to state and international cricket fixtures, and in winter it’s all about Australian Rules Footy. Unless it’s a blockbuster there are always tickets available on the door – a perk of a stadium holding over 90,000 people. The Royal Botanic Gardens are a short stroll across the river, and are home to the Shrine of Remembrance which I encourage you to visit. Take a tram down Swanston Street and you’ll see the shrine shining down from the hill, almost like a beacon. In times when the buildings weren’t quite so overbearing it would have been a constant reminder to the people going about their day-to-day of the sacrifices made by Australian forces in the Great War. Feeling peckish? Head back down to the river and stroll the Southbank promenade. Most of the bars and restaurants down here have a similar offering, but if you want something a little special, head down to Rosetta. This gorgeous restaurant is a love letter to the Italian movie greats that adorn the walls. Order an aperitif and pick through a few Primi plates of crudi and carpacci out in the sun on the terrace. Now head back to the hotel and get changed for the evening. If you’re eating alone, you won’t have too many issues getting a spot anywhere; but if you have guests, it always pays to call ahead and book. Tourists pay a premium price for city views in the evening, but here’s a great way to get the best view – and a Martini at the same time. Head to Lui Bar, located on the 55th floor of the Rialto tower. It’s the restaurant bar for the award-winning Vue de Monde and is one of my favorite places in the city. The view is a sight to behold: almost a 270-degree view of the entire city and, if you time it right, you might just catch a sunset. The whisky selection is brilliant: just let the bartender know what you like and they will do the rest. Head back down to the lobby and jump in a cab to Cutler & Co in Fitzroy. You’ll need a reservation here as well – or you can just sit at the bar, which is just as pleasurable. Cutler is a great example of the diversity of Melbourne’s culinary scene and is simply stunning: the perfect balance of contemporary composition, harnessed through classic, rustic flavours and technique. The marron tail served with a sea urchin custard and Otway shiitake broth is rich and heady in umami goodness. I couldn’t help but order a peated malt to see how it worked – and I wasn’t disappointed. Bars litter the Fitzroy area, the hum of a hundred great nights out wafting down Gertrude and Brunswick Streets. I would begin my bar hop at The Everleigh, a New York-style top-storey cocktail bar, draped in elegance and sophistication. Sit at the bar and order something ‘strong and up’ from Michael Madrusan, the owner-operator, if you’re lucky enough to find him behind the stick. Black Pearl (just down the road from The Everleigh), is one of Australia’s most heavily-awarded cocktail establishments and always commands a visit. Situated in the heart of Fitzroy at the crossroads of Brunswick and Johnston Streets, it has been home to some of Australia’s greatest bartenders for over a decade. This is seemingly where the whole of Melbourne’s hospo scene heads once they knock off – so it’s rarely quiet. If it’s open, check out The Attic upstairs for some pretty serious cocktail vibes. If it’s before midnight (good luck) and you fancy another drink, head back into town for a cocktail theatre show at Eau De Vie, or EDV for short. One of the only bars in the world with liquid nitrogen on tap, this place is all about the experience. Blazers are thrown with reckless abandon, with fire and ice coming together in ways truly mesmerising (and terrifying if you get a seat at the bar). They also have one of the largest whisky collections in the Southern Hemisphere, so if you can’t find a dram in here that you love, it turns out you’ve been a gin drinker all your life. This wouldn’t be much of whisky article if I didn’t include a dedicated whisky joint, and this is one of the best. Whisky + Alement is a tiny venue on Russell Street (drop in for a nightcap before 3am). There is something about the dark, stained shingles, nailed to the walls, that transports you to some candle-lit dunnage worlds away. The tiny space seemingly groans under the collective weight of the 50-odd capacity of malt maniacs, all intent on the task of furthering their whisky education. If you step out into the cool Melbourne morning to find yourself hankering for a late-night fuel stop, you’ll find a plethora of plausible solutions within a short distance. Stalactites is a 24-hour Greek restaurant on the corner of Lonsdale and Russell, and is a Melbourne institution. It serves some of the best giros in town, so expect to queue, especially in the ungodly hours of the morning. If Japanese is more your style, then three doors down is the 24-hour ramen joint Menya Sandaime, serving some of the richest, most luscious ramen that you have ever had in your life. Depending on your state of mind today, we may need to take things a little easier (remember that camel ride back to the airport). Regardless, South Melbourne Market is definitely worth a visit. Maybe for the restorative watermelon, mint and coconut pressed juice that the moment demands, maybe the deep-fried dim sim, another quintessential part of the Melbourne experience. There are lots of ways to while away the long, lazy summer afternoons of a Melbourne weekend, and the city’s rooftop bars are certainly among the best. Madame Brussels is great for a jug of Pimm’s shared among friends, the tea party theme and the wait staff dressed in their tennis whites adding to the atmosphere at one of Melbourne’s first rooftop bars. Bomba Rooftop is just the place for some amazing cocktails and my pick for the solo experience, sitting at its stained copper bar top. Goldilocks has some of the best views in town, but Loop Rooftop takes the cake for the all-round experience. Get there early to get a seat overlooking the city, order a bottle of pink sparkling wine and enjoy the view as the sky begins to change to match your drink (and also your face if you forgot to apply sunscreen before you sat down. Ask the bar – they always have some handy). Now head back downstairs and be greeted by the usual plethora of casual dining options – which has made compiling this selection enormously frustrating. Depending on cuisine, within a few short steps you will have a vast array of options. For Italian I suggest Ombra on Burke with its impressive wood-fired pizzas and exceptional, house-cured and locally provided salumi collection. Rice Paper Scissors is an exciting and great-value restaurant specialising in south-east Asian cuisine. Take a friend so you can share the menu (the Malaysian fried chicken is dynamite with a crisp lager). Further down on Little Collins you will find Magic Mountain, a late-night supper experience of tremendous proportions. Order the lamb shoulder curry with crispy-fried rôti bread to soak up all the rich, moreish gravy; or the beef ribs dripping in a sticky Asian glaze. They’re cooking until 1am – very convenient if your night gets away from you and you’re looking for something more than a kebab and chips. As it’s your final night out before trekking back to the airport, it’s appropriate that we look into the other whisky spots worth dramming in. Boilermaker House on Lonsdale Street currently stocks over 800 whiskies and is rapidly obtaining more. This venue specialises in whisky and beer, served side-by-side in exquisite pairings (hence ‘Boilermaker’). Try the Devil’s Smokehouse – Talisker 10yo paired with Konig Ludwig Dunkel, served with deep-fried bacon drizzled with salted maple syrup. Parts of your life that were once meaningless will become effortlessly complete in an instant. Walk another 100m up Lonsdale to the corner and head into Heartbreaker, The Everleigh’s little sister bar (a little sister who happens to drink 40s and shoots pool with a cigarette between her teeth). Early ’80s power ballads from the vintage jukebox seem to sing the theme tune to every whisky served up, and the great selection of both will have you rocking off your stool. There is still a touch of serious cocktail musing here, with the ‘fabulous four’ (Negroni, Martini, Manhattan and Old Fashioned) all available in pre-batched bottles, hand-filled at The Everleigh. Every time I head back to Melbourne I almost always finish my night at The Melbourne Supper Club. A bastion of old world charm, it’s open until 6am on the weekends and is always a hive of activity at every hour. Push past the queue on the stairs and head up to the rooftop, where you can find Siglo, a bar where you can still smoke a cigar under the stars while drinking a very fine whisky – quite a rarity today. You can bring your own (cigars, not whisky), which is advisable if you don’t want to pay the prices of the in-house varieties, all of which are immaculately kept in the humidor downstairs. I love it here because, whether you are with friends or by yourself, it will always be magical. The light bouncing off the town hall’s architrave, the wrought iron tables and chairs, the wafting smoke drifting above the tables, the bubble of laughter and the clinking of whisky glasses – it all speaks to me on a very personal level. Perhaps this is why Melbourne will always be such a very special place for me. Now: back to your hotel room. You have a camel ride in the morning.